Editor’s note: This is the second of a three-part story about the history of the Tsalteshi Trails, which are the main training ground for three central peninsula high schools and the local centerpiece for skiing and running competitions. Last week’s article discussed how the land was acquired and the trail-making was planned. This week’s article will show how a confluence of motivated individuals opened up the ridge line for skiing, running and mountain biking. The next article will demonstrate the unqualified success of the trail system and its continuing growth and refinement. Photos courtesy of Alan Boraas. 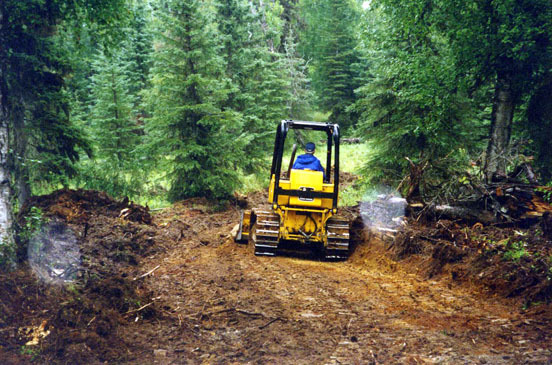 Don Jones, a Kasilof-based volunteer, operates his John Deere 450c bulldozer as he works in 1990 on what would later be known as the Tsalteshi Trails. Over the next quarter of a century, the ski club’s vision evolved into a top-level facility called Tsalteshi Trails, which is used year-round by runners and skiers, walkers and snowshoeing enthusiasts, mountain bikers and a host of organizations seeking a training ground. It is a major draw for all of Southcentral Alaska, it is considered one of the state’s best trail systems, and it has hosted triathlons, state events, qualifying races for the Junior Olympics, Besh Cup series races, and the Arctic Winter Games. But it started rather inconspicuously, and very much on the cheap. “Up until about four years ago, the trails, by design, were very lean in terms of budget,” Boraas said. “We had no borough funding; we still don’t. We had no state funding; we still don’t. And no federal funding. About five years ago, we started applying for major trail grants, so we now have a considerable amount of federal money that has helped with things like lights and so on. Photo by Clark Fair. Skyview cross-country running (and later cross-country skiing) coach Allan Miller works with his first-ever team of Panthers in the fall of 1990, the inaugural sports season for Skyview High School. enthusiastic, talented runners and skiers and keep them excited and motivated — came to Alaska in the mid-1980s to teach after a successful career on the Dartmouth College ski-racing team. After teaching in Yakutat and Glennallen, Miller moved to the peninsula and became a Russian language teacher at Soldotna High School, where his life took an unexpected turn. According to a 1997 Peninsula Clarion article by J.R. Rardon, when Miller arrived in Alaska he was ready to put competitive skiing behind him. One of the motivations for this master motivator was Marlene Benson (now Byerly), who was then one of two assistant principals at overcrowded Soldotna High. In early 1990, when the borough school district decided to open Skyview High School that fall, Benson was named the new school’s head principal, and one of her teaching recruits was Miller. Miller thus moved to Skyview, agreeing in the process to assume control of a brand-new ski program, according to Rardon. 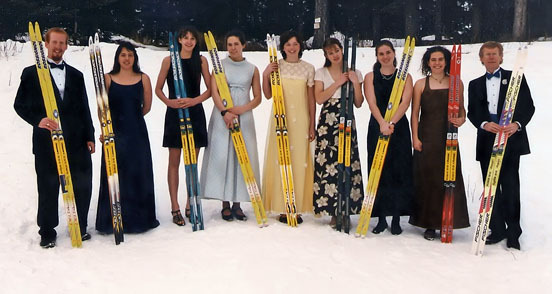 Although Homer and Seward high schools had ski teams, Kenai Central High School’s team had disbanded in the early 1980s, and Soldotna High School had not yet had a team. If Miller hoped to popularize the sport on the central peninsula, he had his work cut out for him. Fortunately, he had been thinking about the possibilities for a few months. In the previous autumn, according to a 1997 Anchorage Daily News article by Gus Guenther, Miller and Boraas had gone together to the Skyview campus, eyeballed the forested hills to the north, and mulled the opportunities they saw there. After Miller was brought on board at Skyview, Boraas became his assistant ski coach. He remembers Miller recruiting prospective runners and skiers to help build the trail — encouraging them to enjoy following the bulldozer, picking up sticks and rocks, and using hatchets to chop through the many tree roots protruding from the exposed earth. Boraas also illustrated Miller’s motivational enthusiasm with this story, quoted here from Rardon’s article: “I can remember the first year we had the ski program, and I was coming down to the intersection behind the tennis courts. I came around and heard singing, and the sun was just going down. I looked out over the field, and there’s Allan with seven or eight skiers behind him, singing Christmas carols. Photos courtesy of Alan Boraas. 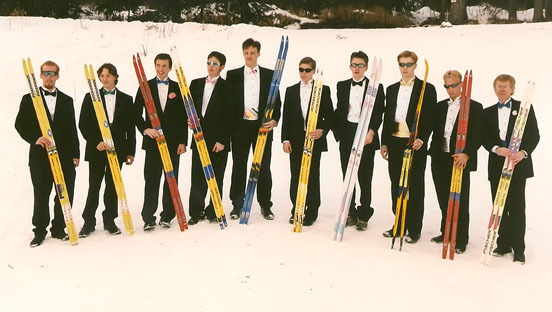 Coach Alan Boraas, at right, poses with his Skyview High School ski teams in the late 1990s. programs, Skyview became almost immediately successful. The Panthers won their first region ski title in their second year of existence, and the success at Skyview made it easier for Boraas and Miller to encourage the startup of similar programs at SoHi, KCHS and Nikiski. But the focus of all this activity and success was the trail system. And all of the planning and dreaming, and all the flagging and reflagging of routes, culminated in late summer or early fall of 1990 with the actual beginning of trail building. First on the agenda was the nearly one-kilometer Green Loop, with Skyview vocational instructor Hans Bilben operating a rented Cat and “putting together a root-infested trail,” Boraas said. Next came the three-kilometer Blue Loop, as they worked to stay ahead of the weather and finish the core of the planned system before the ski season began. 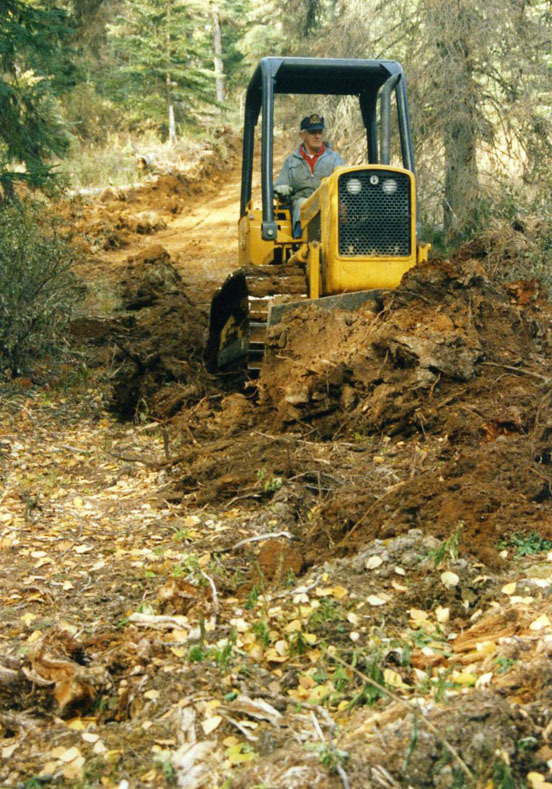 For the more difficult, more finely tuned work, Boraas and Miller relied on the volunteer efforts of retired Kasilof bulldozer operator, Don Jones, who had purchased a John Deere 450c and was eager to assist with the trail-making project. Although Skyview’s first cross-country running team had had to use only the trails on the hillside on the edge of campus, plus the soccer fields, for its racing and training, the first Skyview ski team had the use of the actual early trail system. Boraas and Miller had built it — the trail system and the ski program — and the best was yet to come.